The early modernist Arthur Dove portrayed the natural world as felt and experienced instead of merely seen. Preferring to call his works “extractions” rather than “abstractions,” he presented the purest form of a scene in nature, distilling it down to its essentials. In Boat Going through Inlet, he conveyed the impact of water and wind on a small craft. He enjoyed a peripatetic life along the waters of Long Island Sound, even residing aboard a yacht for a time with his wife and fellow artist, Helen Torr. Dove’s intimate knowledge of the sea is evident here; his treatment of atmospheric mist and vapor expresses the weight of the wind pushing across the boat’s deck. Dove, ever the experimental artist, composed this work of gauzy coats of paint on tin with incised lines that reveal the metal beneath, a technique that suggests the glittering sheen of light reflecting off waves. 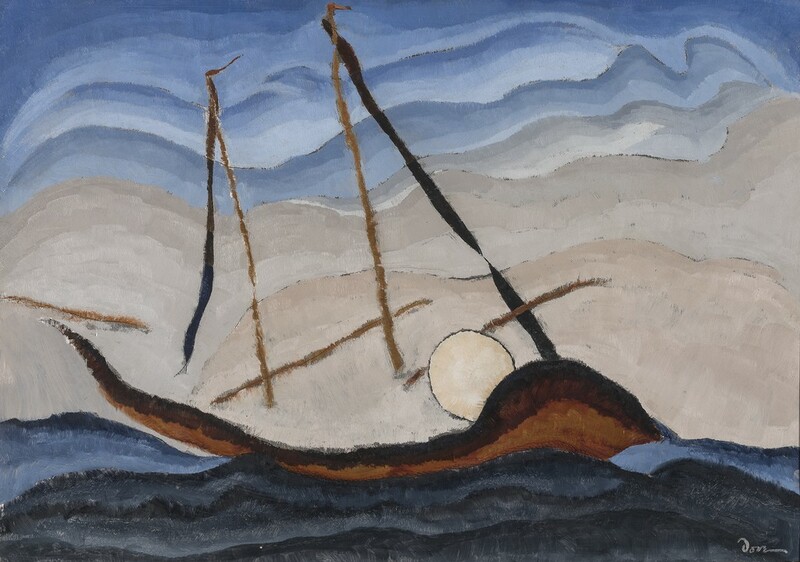 Arthur Dove spent much of his career on or near the water. Beginning in 1924, he and his wife, the artist Helen Torr (1886–1967), lived for nearly a decade on a boat moored at Halesite on the North Shore of Long Island. In 1938, after several years in Geneva, New York, they returned to Long Island and took up residence in Centerport. Dove regularly depicted his shoreline environs: boats on the water, views out to sea, sunrises and sunsets, circling gulls, storm-tossed waves, and beach grasses buffeted by the wind. Like most of these pictures, Boat Going through Inlet renders its subject allusively. We confront not a view of the world empirically observed, but a visual conjuring of forces and phenomena. Thick bands of dark blue and brown curving across the bottom half of the canvas evoke the swell of water and the cut of the prow through the waves, while voluminous arcs of gray, light blue, and pink give form to radiating waves of light and unseen drafts of wind. The clouds of paint that enfold the rigging and crests of blue in the sky materialize the thick, water-laden heft of the atmosphere. Dove regularly experimented with unconventional materials. Boat Going through Inlet is one of several works on metal grounds executed in the 1920s, along with Telegraph Pole (1929, Art Institute of Chicago) and Sunrise in Northport Harbor (1929, Wichita Art Museum, Kansas). It is painted on tin, and light catches on places where the metal is exposed, suggesting the glint of sunlight on water or the phenomenon known as St. Elmo’s fire, a glow that appears at the top of ship masts in the presence of a strong electric field during a storm. This shimmering also calls to mind reflection as an operation instigated by rays of light bouncing off the surfaces of objects. By incarnating this optical function in his painting, Dove makes clear that his interest lies equally with his marine subject and with the means by which humans perceive and interact with things in the world, from boats at sea to light waves and meteorology. Each is evoked through sweeping and interconnecting bands of color, and by hinting at the conductive properties of the metal sheet. Throughout his career Dove preferred the term “extraction” to “abstraction” when describing his art, and the blunt materiality of Boat Going through Inlet embodies this idea. The metal ground, the palpably present pigment, the literality of interaction with light, and the visible pencil drawing emphasizing the artist’s hand—all suggest matter extracted from one context and reconfigured in another, something quite different from abstraction’s usual distillation into essence or reduction to pure form. Dove’s painting insistently retains a direct connection to the phenomenal world, while still radically transforming and reconstituting material existence. This places his work in a fascinating middle ground between reality and representation, life and art. Dove likely painted Boat Going through Inlet while living shipboard at Halesite. The very ground of his practice was an intermediary zone, comprising both land and sea. Boat Going through Inlet is thus a crossroads, a manifold pictorial assembly encompassing near and far, the visible and the unseen, the worlds of nature, humans, and machines—a humble painting of a boat on the water that gathers together all things under the sun.